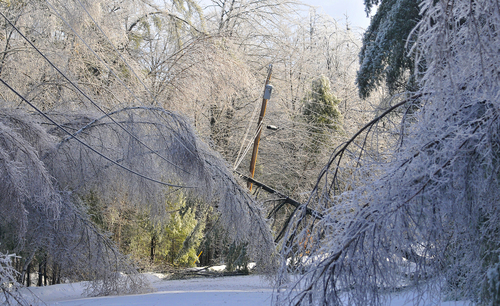 Weather • Ice storm also knocked out power in Canada. GARDINER, Maine • By Thursday, Bob and Katrina Johnson had grown weary of lugging around a portable generator to prevent a freezer-load of moose meat from spoiling and to keep Katrina&apos;s mother&apos;s home warm. 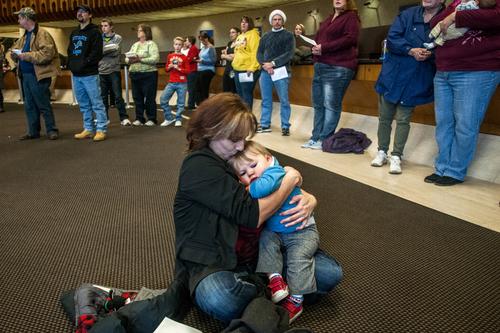 The Maine couple spent Christmas Eve at a family member&apos;s home without electricity. Christmas morning found them at their own home without power. 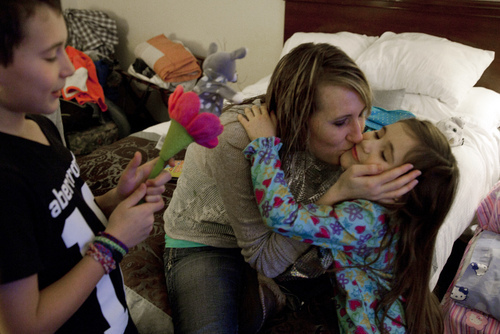 And to complete their holiday, they traveled to a third darkened home to exchange gifts that afternoon. "You have to go with the flow and adapt, and do the best you can," Katrina Johnson said Thursday, before their power was finally restored. "You learn how to deal with it. Do you like it? No, but you deal with it." 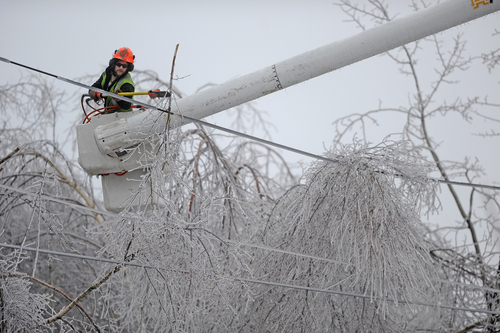 Utility officials said it could be days longer before power is restored to everyone after a weekend ice storm that turned out the lights from Michigan to Maine and into Canada. People shivered for a seventh day as a new storm blew through the upper Midwest and Northeast, shutting down part of the Pennsylvania Turnpike after a pileup involving 35 vehicles. Ten people were taken to the hospital with injuries from the crash. Another pileup on Interstate 78 in eastern Pennsylvania involving 25 to 30 vehicles sent 25 people to hospitals. In Michigan, where about half a million homes and businesses lost power at the storm&apos;s peak, utilities reported that 103,000 customers remained without power Thursday evening and said it could be Saturday before all electricity is restored. In Maine, more snow added to the misery for utility crews working long hours in eastern Maine and parts of the state&apos;s interior. 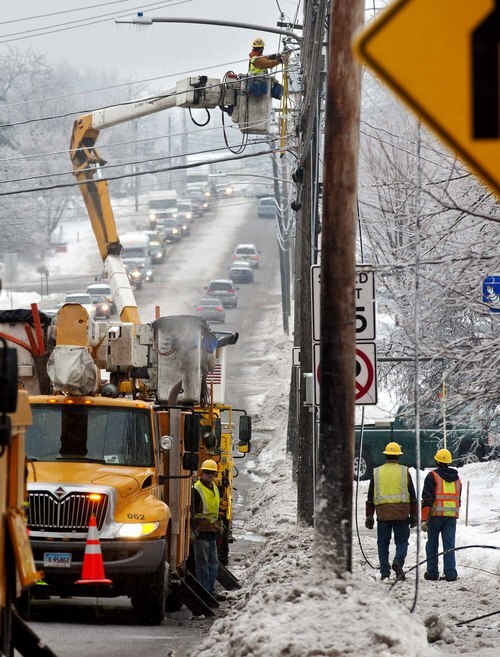 Most utility customers in Maine were expected to have their lights on by week&apos;s end, but there were some pockets where damage was so severe it could take until Wednesday. 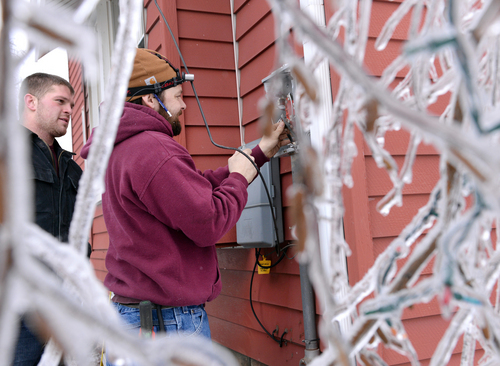 Maine reported more than 21,000 customers were still in the dark, down from a high of more than 106,000. 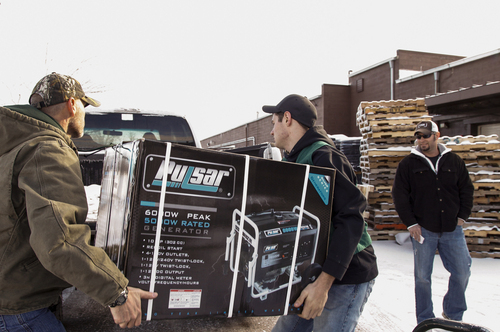 There were more than 101,000 without power in three Canadian provinces  Quebec, Ontario and New Brunswick  including 54,000 in the city of Toronto. A state ferry was commandeered to transport utility crews to restore power to the 600 or so residents on the island of Islesboro, where actor John Travolta has a home. 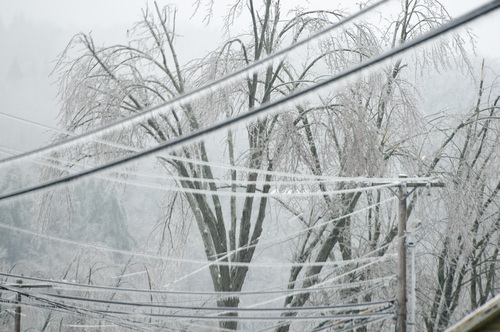 In Kennebec County, where the state capital of Augusta is located, glistening trees sagged under the weight of ice. Many tree limbs had snapped, littering yards. In Gardiner, workers in four bucket trucks from Massachusetts&apos; N-Star utility company worked patiently to get a power line lifted back into place as snow fell. 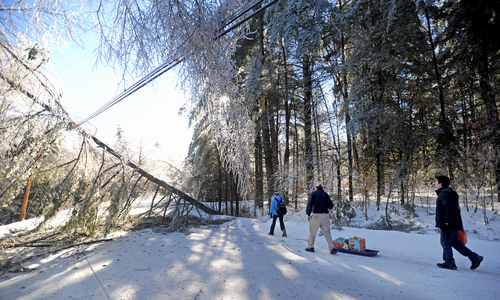 Paul Graham, the crew supervisor from Waltham, Mass., and a veteran of the devastating ice storm of 1998, said it could&apos;ve been worse, even as his team worked its third consecutive 18-hour shift. "Honestly, you got lucky," he said. "If it was a little more ice, poles would have been broken. Things would be on the ground. That&apos;s my take. If there was another quarter of an inch or a half-inch of ice, people would&apos;ve been out for a long, long, long time. "But I&apos;m sure no one is thinking they&apos;re lucky, right?" Authorities blame last weekend&apos;s storm for 27 deaths; 17 in the U.S. and 10 in Canada, including five who apparently died from carbon monoxide poisoning.